Ten World and Foreign Funds are selected that are lower risk and have higher risk adjusted returns. Two Portfolios are created to Maximize the Sharpe Ratio or Maximize Return at 8% Volatility. The purpose is to identify funds that can be used to diversify a retirement portfolio. For this article, I used Mutual Fund Observer Premium Service to select Global and International funds that are lower risk as measured by Ulcer Index and higher risk-adjusted return as measured by the Martin Ratio. 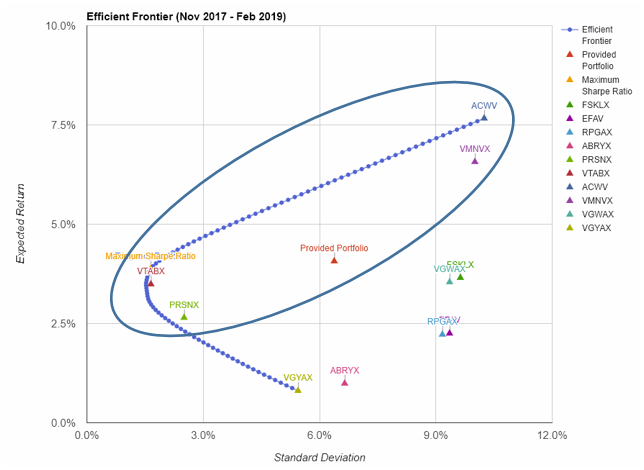 A Model Portfolio was created in Portfolio Visualizer to maximize the Sharpe Ratio of eight mutual funds and 2 Exchange Traded Funds and a second portfolio that maximizes return for 8% volatility. You can see in the table below of Morningstar data that the funds have a higher return rating than risk rating. Each of the funds has a lower standard deviation than SPY (11.2) while dividend yield is generally higher. The Price to Earnings Ratio is also lower than SPY, in most cases. Below are the metrics from Mutual Fund Observer for the past 12 months. Each of the funds is rated Very Conservative (1) for Risk to Moderate (3). I am not advocating creating a portfolio of only World and Foreign Funds, but am using it as a tool to evaluate the funds. I constrained the two portfolios in Portfolio Visualizer to have at least 5% allocation to each of the funds, and also applied maximum allocation constraints. The two Global Portfolios outperformed my baseline fund (VWIAX), but with higher volatility and draw-down. The reason is that allocations to equity is higher. That would have been resolved had I added another bond fund or allowed a higher allocation to the bond funds. 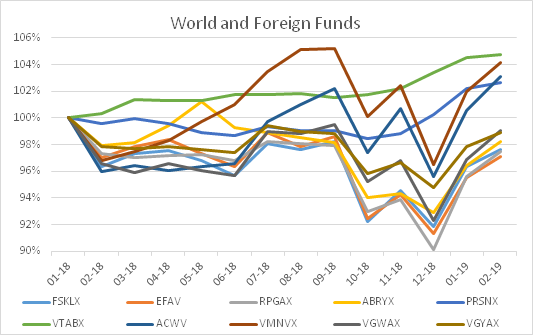 The funds that appear to be the least volatile are the two bond funds: PRSNX and VTABX, the two minimum volatility funds: ACWV and VMNVX, and the Global Income Fund: VGYAX. 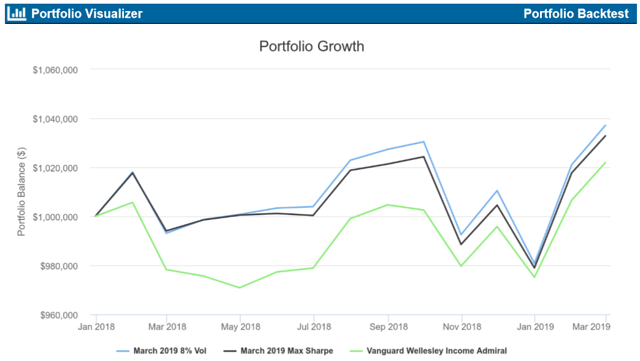 The performance of the two model portfolios are compared to the Vanguard Wellesley Income Fund below. The Efficient Frontier is shown below, and the blue ellipsoid captures the funds with the highest returns for the level of volatility. The Vanguard Wellesley Income Fund (MUTF:VWIAX) is my target baseline fund to beat in a risk-averse environment because of its superior long term performance. Below I compare VWIAX to its global version, the Vanguard Global Wellesley (MUTF:VGYAX) for the past 13 months since the market became more volatile. Performance will be impacted by the strength of the dollar and where other countries are in the business cycle in comparison to the US. Volatility is similar for the two funds, and 43% of VGYAX's equities are US. The chart below shows that at different times VWIAX or VGYAX will outperform. 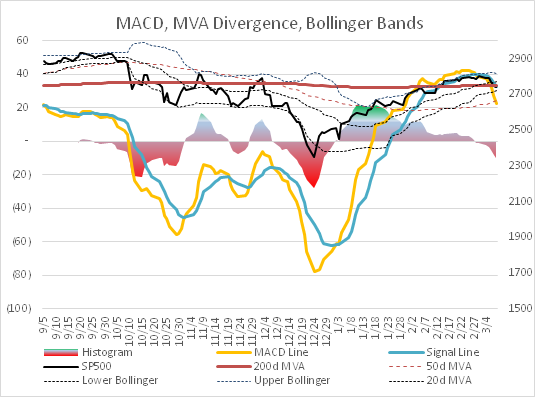 Below is the Moving Average Convergence Divergence momentum indicator for the S&P 500. It is showing that the recent recovery in stock prices is losing momentum. I evaluated the performance of the funds in my portfolio during the recent correction and made a list of those to sell when the market recovered. Since the recent surge over the past two months has lost steam, I feel now is a good time to shift to more conservative funds. Below are the benchmark funds that I track, sorted by increasing standard deviation. I am comfortable with a 30% to 40% allocation to stocks at this time. 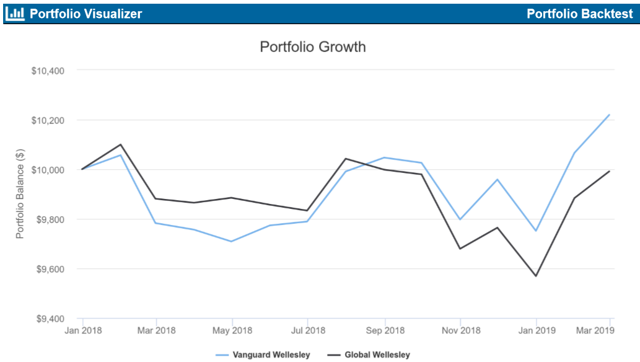 As a result of researching these funds, I exchanged a volatile multifactor fund for the Vanguard Global Minimum Volatility Fund and the Vanguard Global Wellesley Fund to reduce risk and provide diversification in my portfolio. Disclosure: I am/we are long VMNVX, VTABX, VGYAX. I wrote this article myself, and it expresses my own opinions. I am not receiving compensation for it (other than from Seeking Alpha). I have no business relationship with any company whose stock is mentioned in this article.